The traditional argument for the presence of women in forts is that they simply were not there. These traditional models advocate that forts were male/military dominated environments and that officers families would not be present within them. As such, the mobility of the military is focused solely around the movement of soldiers. Previously, it has been understood that women and children would have been associated with settlements outside of the fort structure, but not present within the fort space itself. Evidence in support of this has been interpreted from Roman laws. Under Augustus there was a ruling banning soldiers from marrying, this was eventually lifted in the second century under Septimus Severus. It has been suggested that the commander’s house in particular was designed to house a family unit. These structures were large and Mediterranean in style. Evidence from Vindolanda features a correspondence between Flavius Cerialis, which implies he was accompanied by his wife (Campbell, 2010). Within the commanders house structure at Vindolanda there is also evidence of multiple small shoes, thought to belong to children (Campbell, 2010). A tombstone has been discovered in High Rochester, thought to have come from just outside the fort space. The inscription is written by Julia Lucilla in memory of ‘her well-deserving husband’ implying that they would have been living in the same space (Roman Inscriptions of Britain, 2018). 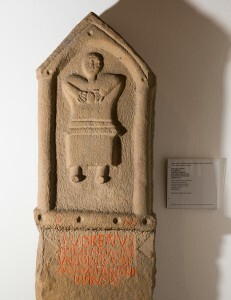 Another tombstone from Corbirdge was erected in memory of Ertola aged four years and sixty days, thought to be a child of one of the soldiers within the fort (Roman Inscriptions of Britain, 2018). Arguably, this evidence would suggest that women and children were associated with fort spaces, and it can be implied that their presence is not just restricted to the surrounding vicus’ outside of the forts. I hope that from this brief overview you can see that the evidence for women and children inside fort spaces is still open to much debate. However, it is entirely possible that family life played a much greater role within the military than previously thought. Just like our current currency system, the Roman system was made up of different denominations of coin, with different materials being used to create the higher status coins. Image taken from the Portable Antiquities Website. Occurs when the precious metal of the coin is reduced and new denominations are added to the currency system to try and counter balance the effects of inflation. The most commonly found copies in England are Barbarous Radiates. In other news, you may remember in our previous blog post, we hinted that we were introducing ‘themed’ months, to give you a bit more insight into Roman Ribchester, and the work we have done on the project so far. 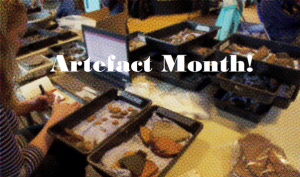 February sees the introduction of our Artefact Month! 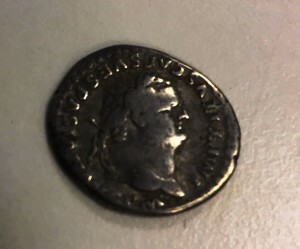 Check back next week for an introduction to Roman Coins, the images used on them, the types of coins they have, and how we go about interpreting the writing on them! Our UCLAN students have returned from their Christmas breaks, and are ready to tackle to the second half of the academic year. The Ribchester team have also been busy, since 2017 ended. Our radio silence, o far this year has been because we have been planning some new content for you all to enjoy! This year we are going to introduce themed months to our blog, to try to give you a bit more background and detail to Ribchester as a site, and our work there. February will see the introduction of our ‘Finds Month’. Throughout February, the blog posts will be focused on the types of objects we have found, and what they tell us about Roman life in Ribchester. Over the following months, we will be discussing past excavations at Ribchester, what our excavations have told us about the site, introducing some of the team who you may see hard at work this year, and behind the scenes of our preparations for the dig. 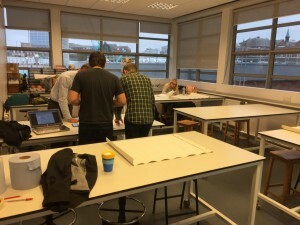 An important part of the Ribchester Revisited project is student training. During the dig more experienced masters students run small teams, giving them experience in leadership and team management. As part of their work the masters students then complete reports on their section of the trench. This blog post discussing the guardhouse is by Louise Clempson, the masters student tasked with the guardhouse excavation. Ribchester Revisited 2017 saw the excavation of the guard house floor located in the northern section of the trench: as shown by figure 1 above. As a Masters student, I supervised the team excavating the guardhouse. The perimeter of the clay surface was recorded using specialised equipment (total station) in order to construct an image of the guardhouse in the lab. Furthermore every object found was 3D recorded using this equipment and given its own unique identification number. This allows us to understand exactly where in the guardhouse each type of object was found. 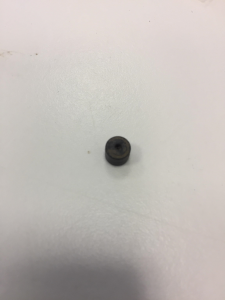 From this, connections could be made regarding specific patterns that cannot be detected in the field. All the finds within the guardhouse were mapped using a GIS computer program (QGIS). As you can see there is an obvious pattern emerging from the finds of these first few layers of the guardhouse floor. The finds seem to be concentrated in certain areas: these being the southern and western edges with a clear lack in finds from the centre and northern edge. This can be explained by looking at the guardhouse more closely. The entrance will have been by the threshold stone as shown and unfortunately the edges of the floor have been truncated by Thomas Mays Trenches which he dug in his 1907 excavation (Buxton and Howard- Davis 2000). Therefore we can assume the guardhouse floor was larger than we discovered. Therefore the current edges of the floor are several centimetres away from the actual edge, whereas some edges may well have been close to their original position. This would explain the pattern showing as normally in a room waste gets confined to the corners, with the centre being reasonably clean as this will be where the main activity takes place. Placement of furniture could also impact the loss and placement of objects. The finds themselves are extremely interesting as one of the main type recovered was animal bone. There was a heavy concentration of animal bone found in the southern side of the guardhouse. We are still awaiting zooarchaeological analysis; however, on first look most seem to be cow or pig. Moreover, two sizeable bones were found in situ; a pelvis and a scapula (shown in figure 2). The reason for the high concentration of bones in the southern section of this space could be due to how the space was used. For example, the southern area could be where food was consumed therefore small pieces of bone lying around would be normal. The longer bones are more difficult to explain our working theory is that long bones were placed to even out the floor surface and make it more substantial before another layer of clay was added, this has been seen before however needs investigating next year. Shown above are the pottery finds from the excavation (Figure 3). Again, a similar pattern is emerging with a concentration again in the southern section of the guardhouse. But also some scattered along the eastern edge. Most of these were small fragments with the exception being a base of a pot found with a maker’s mark, discovered in last year’s excavations in the eastern section of the guardhouse and excavated this year much to the delight of the students. The fact that small fragments were found lead us to the conclusion that these were deposited randomly from perhaps several smashed or chipped vessels. Figure 4 demonstrates all of the material associated with metal working. The dark purple spots representing metal slag which is a bi product of metal working and the light purple represents nails which are associated with building. There is a cluster of slag towards the eastern section which could lead us to believe that metalworking was taking place in this area at one time or another. 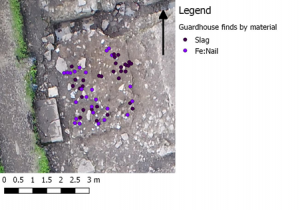 Perhaps once this space wasn’t being used as a guard house it was repurposed for metal working which isn’t unheard, similar evidence was found for a guardhouse at Birdoswald (Biggins et al 1999). It will be interesting to see if these same patterns continue to show in the 2018 excavations as the guardhouse when the final floor layers are removed. The finds will continued to be plotted so it will be possible to analyse the patterns in the lab once the excavations have been completed. Biggins, J. A., Taylor, D. J. A., Coxon, B., Esselmont, B., Frank, A., Hudson, C., McCloy, P., Montgomery, E., and Robinson, J. 1999. 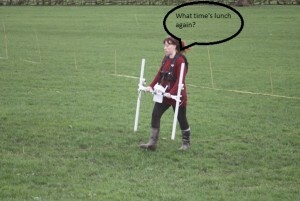 A Survey of the Roman Fort and Settlement at Birdoswald, Cumbria. Britannia 30. 91-110. Buxton, K. and Howard-Davis, C. 2000. Bremetenacum. Lancaster: Lancaster Imprints. 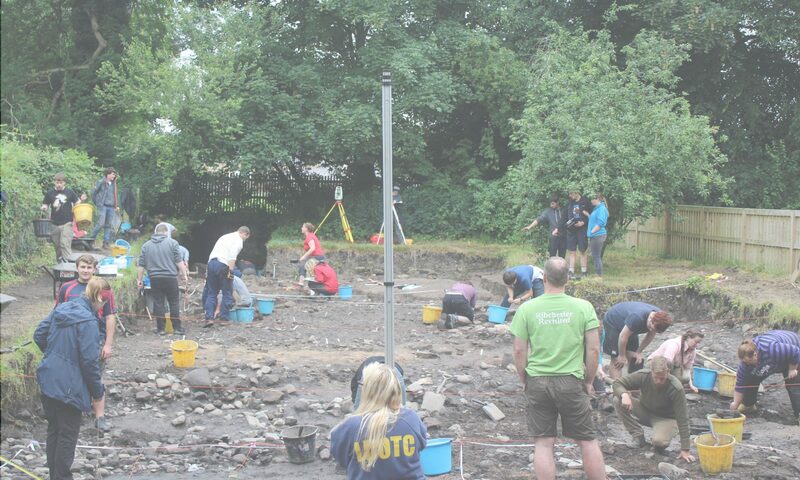 Each year our UCLAN students have to write a field report about their summer excavation when they return to university, and each year we ask for extra elements to be included into this report to demonstrate how much they’ve learned. Context number 1 was directly underneath the ground surface and is therefore the most modern. 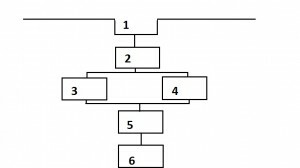 Context’s 3 and 4 were found at the same level so they are believed to be buried around the same time. Finally, context 6 is the furthest down so that means it contains older archaeology. This example was a simple one, but our MSCi students have to piece together each context from this year’s excavations and produced a much larger matrix to cover the entire trench. 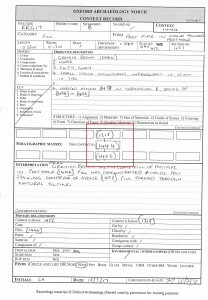 As you can see in the red box, each sheet has a smaller Harris Matrix, telling you which context was above and below it, and from these you can piece together the end product, covering the whole site. That’s enough practical talk for one day. Here’s some pictures of our MSCi students trying to wrap their head around this year’s excavation. 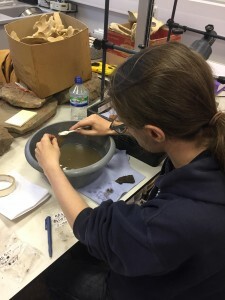 You may remember a couple of weeks ago we posted on Facebook to say that one of our volunteers, Cassie, had been nominated for Young Archaeologist of the Year. We are extremely proud to report that Cassie won the award! Cassie hard at work on this years excavation! I’m sure you’ll join us in congratulating Cassie and all of the other nominees on their achievement! 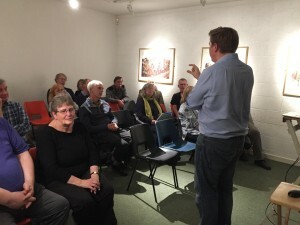 On the 12th October, we took a trip back to Ribchester to present this years’ work to the Friends of Ribchester Roman Museum. A big thank you to those who came to watch Jim’s presentation, and persevered with us despite a few technical difficulties! We excavated the two large ditches at the northern end of our trench, we believe these were used to define the grounds of the fort itself and were located outside of the fort wall. We’ve identified evidence of a workshop; using scientific technology we have found traces of mercury, lead and gold. This suggests that they were using the process of gilding, which involves painting a very thin layer of gold onto the surface of an object. Before our excavation season began this summer, we had the opportunity to carry out some geophysical surveys in other parts of Ribchester. The aim of this was to identity other possible archaeological features within the village, and it enabled us to try and identity the extent of the Roman activity. This work was carried out in conjunction with Historic England, and once they have finished with the results we will be able to release them on this website. My name is Viki Le Quelenec and I’m a PhD student here at the University of Central Lancashire, as well as the research assistant for the Ribchester Revisited project. I’ll be using our blog and social media channels to keep you up to date with what we get up to when our rabble packs up and leave the village. The 2017 season of excavation came to an end in July, but our work is not yet done! A lot of our archaeology takes place back in the lab, and as we appreciate all the support we have received through social media we wanted to take you along for the ride. Since the end of our excavation season we have been busy with post- excavation from the dig itself. A large part of this work has been washing the finds from the last few days of excavation. It is important that washed finds have enough time to dry before they are processed to avoid them becoming brittle. Some finds are brought back to university with us in the same condition they were taken out of the ground so that we can process them back at our lab. Below is an image of one of our UCLAN students Micheal washing some of the finds from the guardhouse. This may not seem like the most glamorous job but Micheal has been a real trooper dedicating his time to helping us get this done. Micheal, Second year UCLAN student. An archaeologist’s job revolves around paperwork, and keeping detailed records. Both before and after a feature is excavated scale plans are made. These plans play a crucial part in understanding the archaeology and forming our interpretations (though the students may not always like drawing them at the time!). For these plans to be usable in publications and presentations they need to be illustrated. From this we can begin to layer the plans to see where each feature fits within the trench and the levels of stratigraphy we are working with. I like to think of stratigraphy like a rainbow cake, each colourful layer is crucial to producing the overall cake, but each layer is different. Stratigraphy in archaeology works the same way, each layer of soil can represent a different action in time, and if we want to understand how the buildings of the fort were constructed or changed over time, we need to understand each layer. Illustrating plans can be quite time consuming as you must trace over every line and stone on the drawing, but it’s quite satisfying when one is complete. Here’s a video below to show the difference, just like magic! On that note, I better get back to it. 24 down, 169 to go. So many plans so little time! At Ribchester Revisited, we want to give our students the opportunity to get as much experience as possible. In the trench, they practice many aspects of archaeology: planning, trowelling, interpreting, recording, etc. But it’s not just about the digging; there are also optional side courses, where students can leave the trench for three days to help an expert with another facet of archaeology. These courses are Environmental Sampling/Archaeobotany, Finds Washing/Recording, and Outreach. Each of these courses gives students a chance to experience a different type of archaeology and let them explore some specific fields within the broad category of Archaeology. First, we have Environmental Sampling. 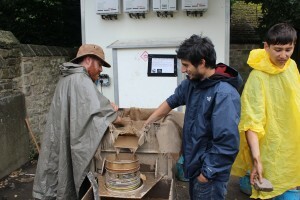 On this course, students work with Don O’Meara, science advisor to Historic England and professional archaeobotanist. First working through the wet sieve, students take environmental sample buckets from the trench and run them through several sieves and meshes. These will help sort out materials by size, in addition to letting organic materials float to the top. These can be tiny remains of charred wood or seeds, among other things. Once any organic materials have been collected, the sieves are sorted into trays to dry. 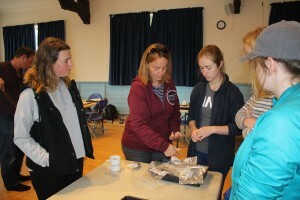 Students on this course will then sort through the dried samples and collect any finds that have been missed before sorting the gravels left over. Through this process, we are able to take samples from all around the trench and closely inspect a representative amount of soil. These environmental samples can be hugely important for figuring out who is in the fort, as well as with dating; recently, a sample from the guardhouse yielded what may be some domesticated oat. 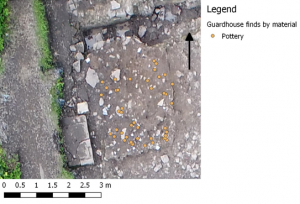 Oats were not domesticated until the post-Roman period, so evidence like this can help us push back the date of occupation and help us understand how long people are using the fort after the end of Roman Britain. Those who choose to work on finds with Justine Biddle also help us to look at what comes out of the trench. While our experts will be doing the interpreting of what some of the small finds are, students can help with the cleaning and recording. As far as bulk finds â€“ things like bone, pottery, slag, and nails â€“ students will take finds trays from completed contexts and clean off all the finds. This is important so that one can see any identifying marks on the bulk finds that would make them become a special find, like graffiti on a bit of pottery. The finds also have to be free of dirt, so that when they are counted, weighed, and bagged, the extra weight of the dirt does not affect records. 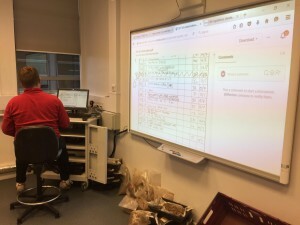 Besides washing finds, students also record them; for the bulk finds, that involves weighing and counting each type of find per context and entering those data into the database. 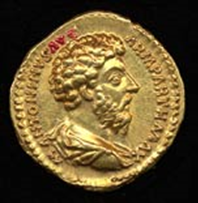 For special finds, called small finds, such as coins and jewellery, students will take photographs and carefully record the dimensions, as well as any identifications that have been made, in the database. These detailed records of bulk finds and small finds help us to identify what each context in the trench is, and what was going on at that layer of archaeology. 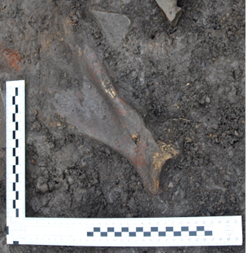 In post-excavation analyses, some of these finds will be sent off to experts; bone specialists can identify which animal bones are from, as well as any significant marking such as cut marks that would indicate the animal was butchered; metalwork specialists can x-ray metal objects to help see past corrosion and tell the original shape of the metal object; pottery experts can say during what period certain types of pots were made, or if there’s a maker’s mark, even who made it and a very specific range of dates in which it could have been produced. Lastly, students can go on Outreach for a few days. Here, we focus on the interactive part of archaeology. There’s no point of digging if nobody is sharing what happens, so students on outreach will conduct tours for people who visit the trench, make informative videos to post on our YouTube page, and help manage the social media accounts on Twitter, Facebook, and even this blog! The outreach part of the archaeological process is essential to keeping our dig relevant, so we are happy to welcome visitors to our trench for a tour where we can explain how the dig is being conducted, what is going on in front of you, as well as our current theories and interpretations about what was going on in our Roman fort at this time. Video diaries give everyone with internet connection a chance to see the trench and hear our students speak about the work that they’re doing. 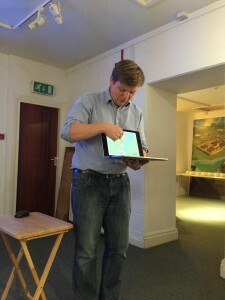 Lastly, students will help to manage the social media outlets of Ribchester Revisited, so that we can reach more people and keep those interested up-to-date on the dealings of our dig. 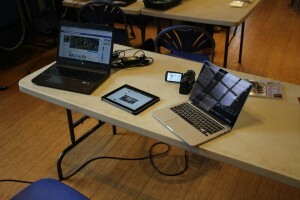 All the tools for Ribchester Revisited’s social media presence, except the camera used to take this picture!